The iJoy Captain S Sub-ohm Tank is a 25mm tank system now with sliding top fill capability, yet retains the original specially designed groove for heat dissipation, and thread-less coil system for east coil replacement. The Captain S Sub-Ohm Tank holds up to 4ml of E-Juice and is conveniently filled via the sliding top fill system with large fill port. 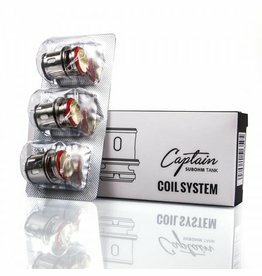 With the integration of the CA thread-less coil system, the Captain S Sub-Ohm Tank offers an easy to change coil system with performances comparable to other tanks in its category. iJoy has implemented a unique channel below the glass segment of the tank to aid in heat dissipation, keeping your E-Juice from over steeping. The iJoy Captain S Sub-Ohm Tank is a great contender in the Sub-Ohm Tank market and is a perfect match for the iJoy Captain Mod.